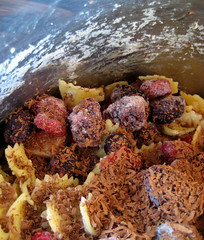 So my Filckr friend Molly posted this arresting photo of "Pasta with fruit and chocolate." I've been quietly obsessing about how this would taste. I hacked my own version. I would highly suggest that you do NOT attempt this recipe or anything like it, if you value your figure. I am pretty sure that I just gained 5 lbs. Mix crumbled choc and marscapone in, till it gets all melty like. Now pick up a piece of the creamy pasta with a fork. Bring it to your lips. Let the silky creamy sweet pasta slide into your mouth. Chew, taste the sauce and bite through the tender al dente pasta. Empathy vs Sympathy vs Telepathy . .
"Empathy may be painful to oneself: seeing the pain of others, especially as broadcasted by mass media, can cause one temporary or permanent clinical depression; a phenomenon which is sometimes called weltschmerz. Telepathy is, "I know how you feel because I'm reading your mind.""